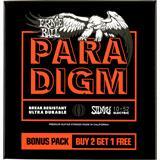 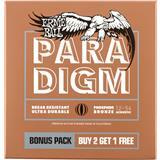 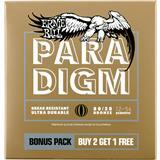 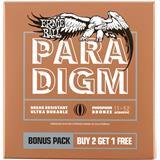 Ernie Ball Paradigm guitar strings, buy 2 get 1 free! All new Paradigm Bonus Pack, buy 2 get 1 free! Featuring the first fully backed guarantee - if Paradigm strings break or rust within 90 days, Ernie Ball will replace them. 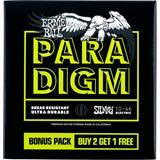 Paradigm strings feature superior break-resistance and unparalleled durability while delivering the iconic Slinky tone Ernie Ball is known for.